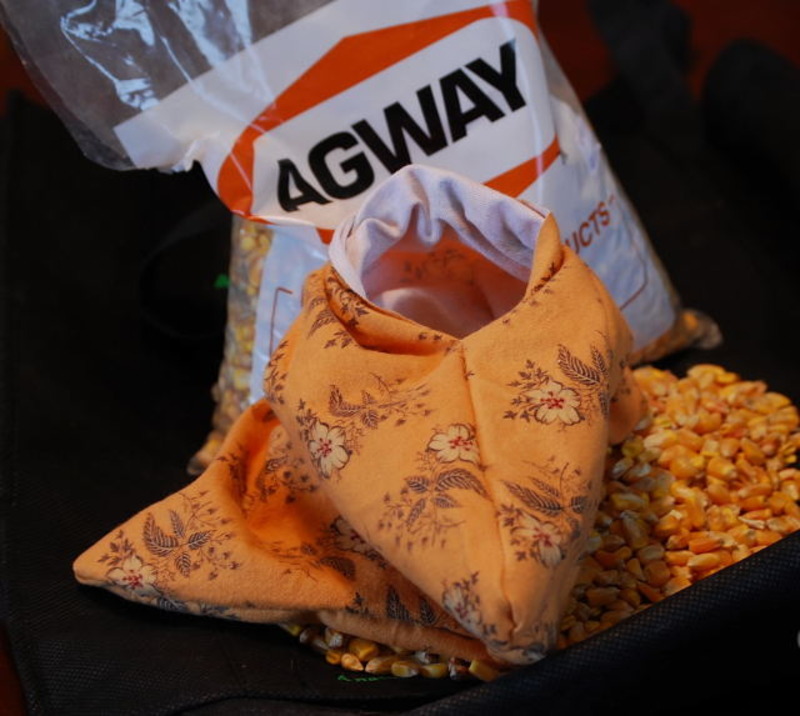 The other day, I gave away a corn bag here on my site and some of you asked me if I could show you how to make one. They are so easy that I feel dumb even trying to explain it. 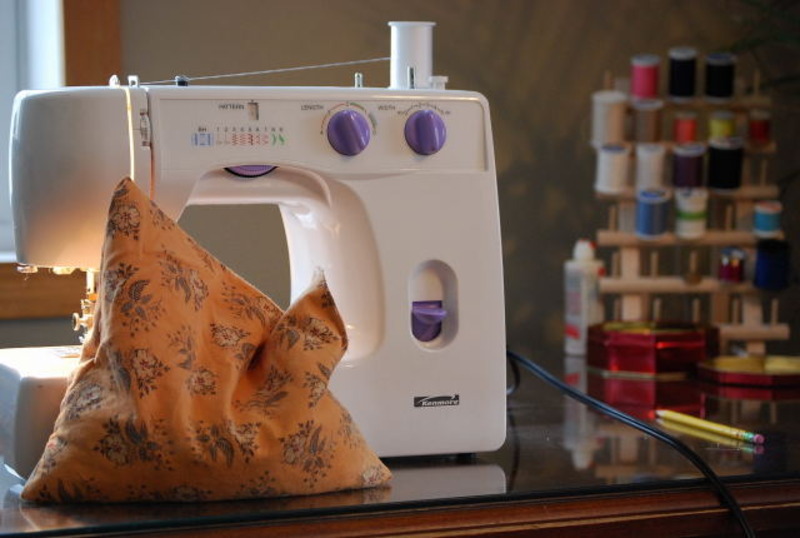 I believe anyone could make one, even if you don’t have a sewing machine. It would take no time at all to hand sew one for yourself. The most difficult part for me, was locating the corn needed to fill the bags. 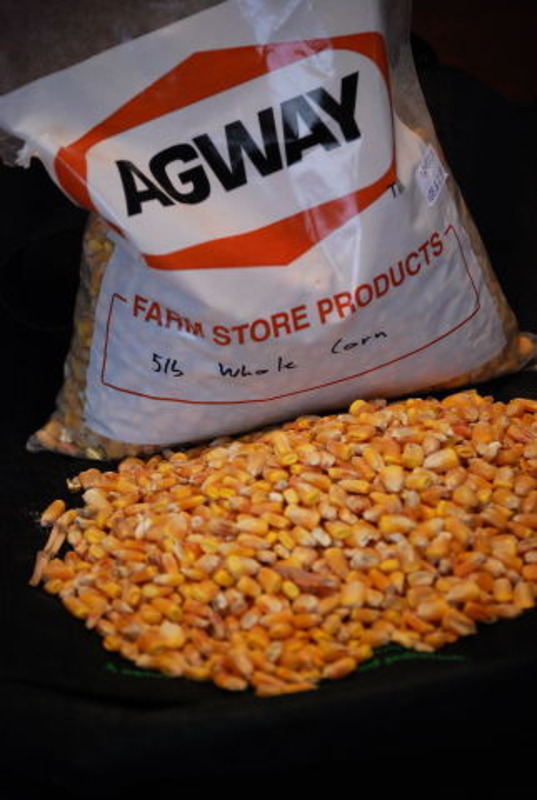 You will need feed corn and I found some at a local AGWAY store, it was 2.99 for a five pound bag. You can make the size of your corn bag as big or small as you wish. Today, I cut a piece of flannel that was 21 inches by 12 inches. I recommend using a nice, BEAUTIFUL, thick piece of flannel. Fold your fabric in half, edge to edge, wrong side out. And pin. 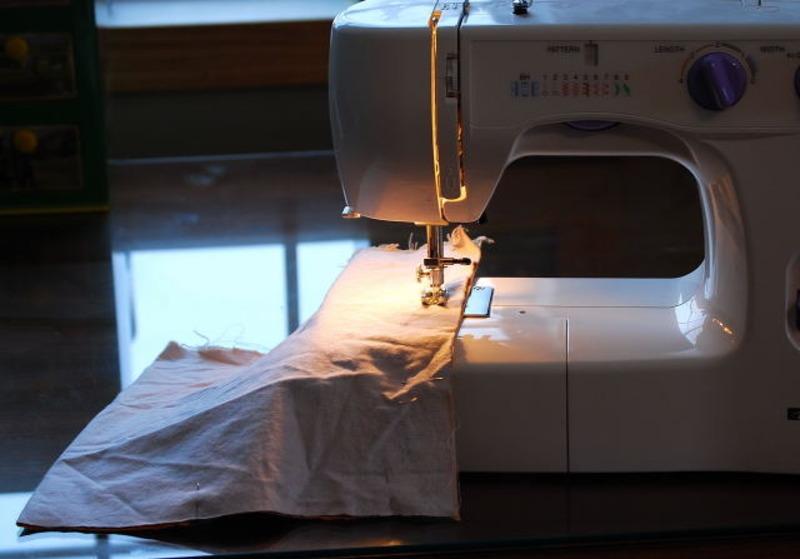 Use your sewing machine to sew around the edges, leaving enough room at the end to turn it right-side out, and to fill it. Sew the seam together with your machine, keeping close to the edge and making sure that you do not leave any size hole whatsoever, or you will be leaving corny bits where ever you take your bag. Your corn bag is all done! Now you can use it. 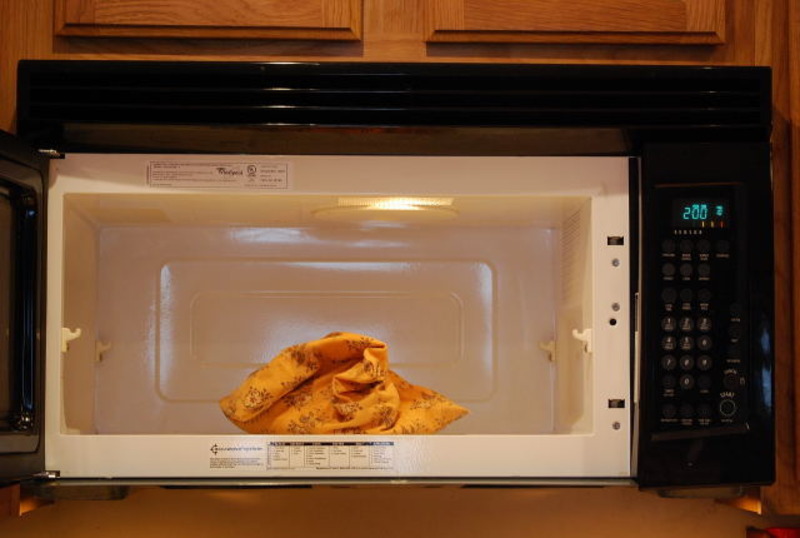 Microwave for about 2 minutes to make it nice and warm. Thanks, Mom, for scrubbing out my microwave while you were here. It’s because of you I could take this photo without shame. Carry your bag away and warm your feet with it. It also feels nice on your lower back, if you have a back ache. Someone told me that you could also put one in the freezer, to put on your head, if it aches. Ridiculously easy, don’t you think? 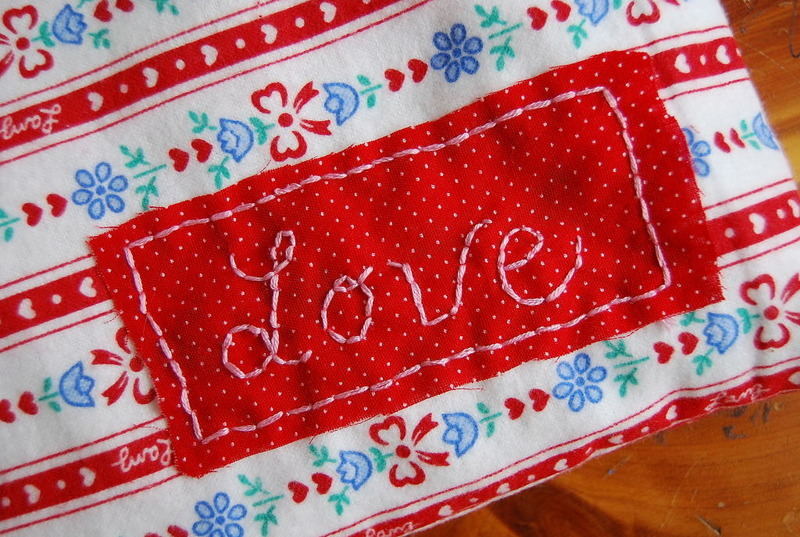 Now, if you want to make a label for yours, just go ahead and embroider a word or phrase on a piece of different fabric. I used 4 strands of embroidery floss the other day when I made mine. I sewed the label on by hand, using the same embroidery floss, before I sewed up the seams to make the bag. If you have any questions, feel free to ask. I hope I did okay at explaining. I don’t see how you could go wrong, however, unless you use pop corn to fill it. Don’t do that. 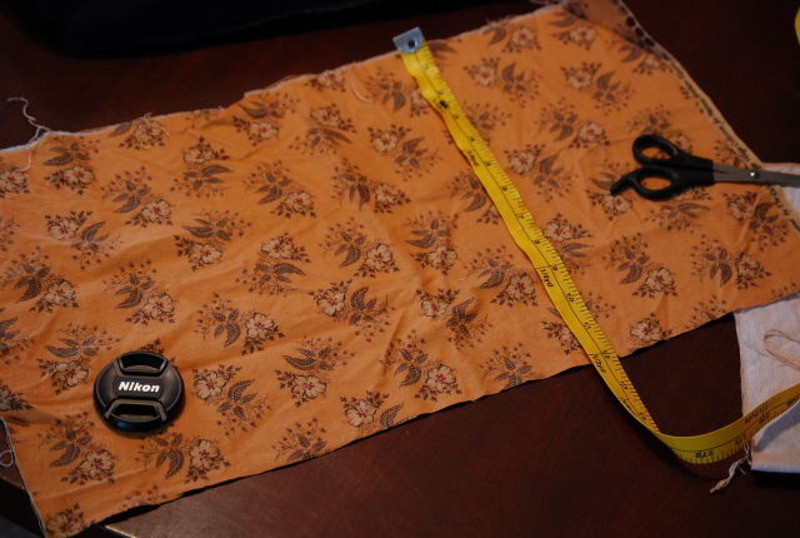 This entry was posted in a simply lovely life and tagged howto, sewing by Shanda. Bookmark the permalink. I have a cornbag that looks like a small Bear Cub…i scare the cats with it ; ) Shanda, thank you for your e-mail today. Tell the kids I said hello. “in the freezer, to put on your head, if it aches.”If THAT makes you laugh, I’d hate to think what you would have thought of me November/December of 2007 when I put my head in the freezer and laid it on frozen bags of vegetables to help ease my headache!!!! LOL!I have also heard of these bags made up from rice instead of corn. ok, i’m going to make one…my toes are always frozen this time of year,actually i think my feet are cold all year round!i will get alot of use out of it!..i can’t wait to hear you had the baby….i’m checking every day now cause he’s almost done!! Finding the corn would definitely be the hardest part for me. There is no feed store here. Not a big agricultural area here. They sure do look easy, though! I guess I don’t have to worry about making myself one anyway (wink, wink)! We are having more snow also, but they don’t close the schools for snow around here for some reason?? I liked the picture of your pretty pink toenails curled up against your brand new cornbag. Cute! that is so cool. wish i could sew AT ALL. Thanks for posting this “how to”. I don’t have a sewing machine so it looks like I’ll be doing a lot of hand stitching (or wait till I go to my moms) but I do have the corn. That’s what we heat our house with. =] I think we are getting the same storm here in Ohio. The schools are closed and my outside looks much like yours. Hope you have a great day! oh I’m so glad you mentioned where to get the corn! 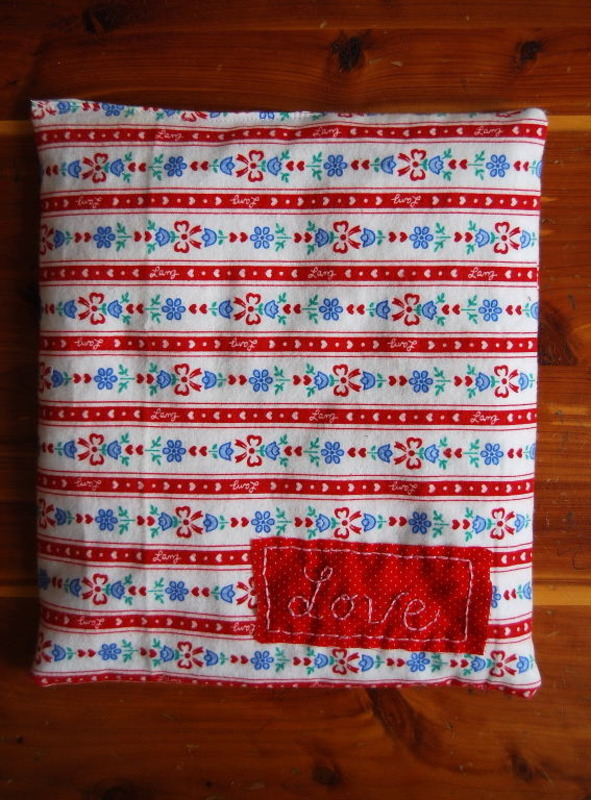 thanks =) I want to make each of my boys a corn bag for valentines day! Thats beautiful!!! How cool!!!! 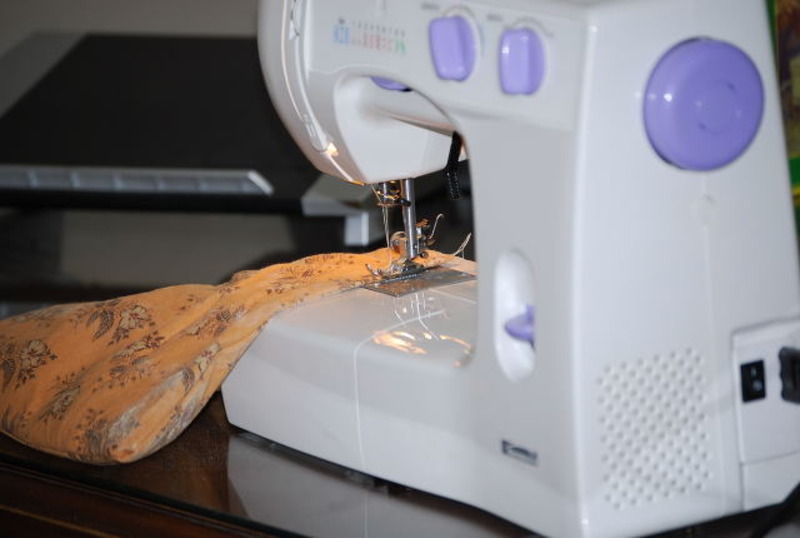 I thew out my broken sewing machine. Drat!! !Where in NE are you? You gave wonderful directions! We, too, are enjoying a snow day inside… Actually an ice day is more like it. My favorite picture was of your toes getting toasty! Filling it with popcorn might be interesting….Thanks for sharing. I love your pink toenails. 🙂 I hear you about the microwave…my mom sometimes cleans mine when she is over too. It’s just one of those things I hardly ever get to! Thank you! I also have seen/used the cherry pit pillows. Same idea. And I have a friend who made the rice one and added some lavendar oil to the rice – mmmm. How sweet that you are a grown woman with 6 children and your mamma cleaned your microwvae for you 🙂 I guess we never stop nurturing and loving our kids, no matter how “grown up” they are! 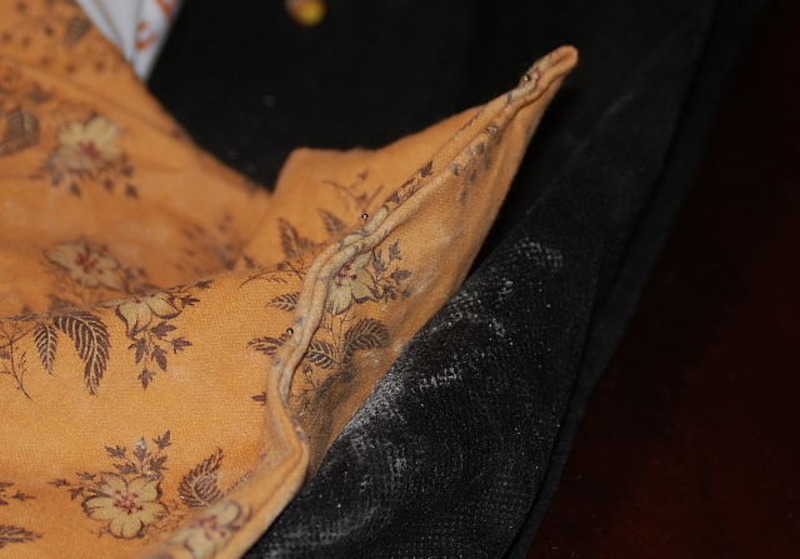 Love the fabrics you used for your corn bags–also thanks for taking the time to explain how to make one. I think I could have figured out all the sewing stuff, but I DEFINITELY would have messed up the corn and ended up with popcorn-lol Have a wonderful day! I am with you there! I have both put my head in the freezer, and in a real fit of pain, bashed it against the tile of my bathroom (it is amazing, but it felt good). THAT disturbed my husband though; he dragged me away and held me down in the bed. SHAN – this is one of your best posts EVER!!! You don’t let us rec you anymore? *sigh* well, the pics, the instructions, the cheery sound of your “voice …” Great job! wish I could sew. I bet those little suckers would fall out of my crocheting, right? ha ha ha! I’m an idiot. I found the rec button at last! You did a great job giving the instuctions…I love step by step with pictures! I have always made more of the recipes in my cookbooks that include a photo. These would be great valentines for our elderly loved ones too! Oooooh, and girlfriends We do have a feed store nearby…we are in a horse area around here. My husband buys 50# bags of organic rolled oats from Oregon to fill his and David’s tummy with, and sometimes when he picks them up from the healthfood store they ask if it is for horses…lol. I love the snowy scene with the boys walking the dog! So pretty. That’s really spiffy, if I actually sewed. 🙂 So not a sewing type. Very cool concept, though. I loved the part about corny bits! Very cool! I will try to make one as soon as I get some corn! Thanks Shan! 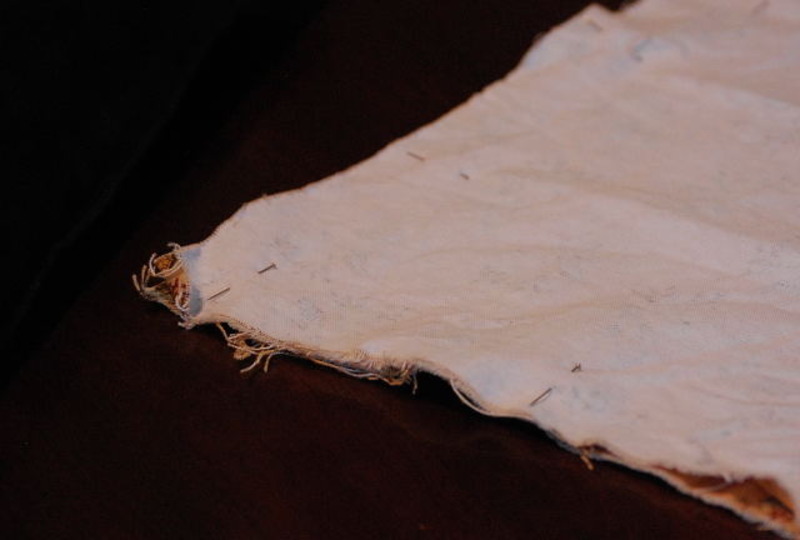 How neat – I’ll have to attempt to make one – I seem to be all thumbs when it comes to sewing. I love your snow pic’s. We’re from MA and miss all the snow and wintry weather. Not much snow where we are in Cali, but we are enjoying all the beautiful sunshine. You make me want to learn to sew!! I actually might try and make this. Thanks for sharing! I need step by step instructions. Using my corn bag right now (and I have my husband’s in my bed warming it for my arrival after LOST!!! Well, with instructions as wonderful as those, I guess I have no excuse but to get my BRAND NEW UNUSED sewing machine in out of the garage. A project like this would be good for me. I’ll try to post a picture of my effort. Bless you Shanda!! Thanks, Shanda! I can’t wait to get some flannel and corn and make one. I think everybody I know is going to get one of these. What a fast and easy project to do this summer on those rainy afternoons, or even after a day of swimming! Thanks Shanda! I stared at that clean microwave for several seconds.. trying to get inspired!! =)you’re so creative dear~ and loved reading the last post. just precious. How long do you usually put it in the microwave for? sounds amazing!no idea how to use a sewing machine =)so i guess it’ll be attempting to sew by hand =)at least corn kernels are bigger than rice =)thanks so much! My first thought was how clean that microwave looked and how that is possible with so many kids! LOL! Did I tell you that Mom N. used mine once and then she liked it so much she went to Agway and made one for her and one for dad and they use it every day? !